Lucky me!! Colonial Candle sent me all their new spring scents in melt form to test out, six fragrances total. Some I couldn’t wait to try, others I was a little “iffy” about since they were floral but who knows… maybe I’ll love them for all their unique qualities. It’s happened. 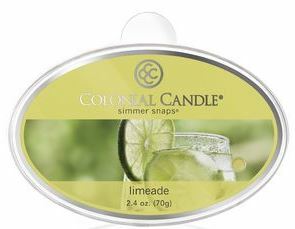 Colonial melts are called Simmer Snaps and are 2.4 ounces each and packaged in really pretty oval plastic containers. If you aren’t a melt lover, no worries… all these new scents are also available in their gorgeous oval jars as well. These will be short little reviews on each fragrance, links to each scent listed below. A sparkling burst of lime is blended with fresh green notes of agave nectar and captured by crisp herbaceous notes for a refreshing aroma. Shimmering red berry blends with fresh-cut rose, silver driftwood, and English ivy for a calming walk through the garden. This tropical escape begins with exotic fruit juices of guava, papaya and bright citrus which is complemented with a sheer floral bouquet and island coconut waters. A blend of clean and calming florals combine with nuzzly musk, soft denim, and a delicate lace accord to evoke the comfort of your favorite spring outfit of the day.